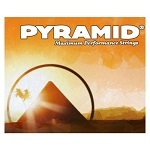 Pirastro as the world-wide leading manufacturer of strings has gained extensive knowledge since 1798. During all this time gut strings have been considered as the most beautiful sounding strings. Today Pirastro offers an alternative to the needs of violists with its new Passione for viola: The gut string for the 21 st century! Please read below the product description. * Very short playing-in-time, nearly the same as for synthetic core strings. * Substantial increase in tuning stability. * Easy response on all levels of the dynamic range. * The accuracy of contact point is easily manageable, similar to Obligato and Evah Pirazzi. * Easier right hand articulation and tone attack. * Typical beauty of gut string sound. 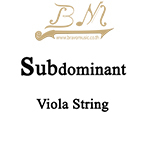 * Fascinating diversity of sounds , which allows musicians to alter their tone as desired. * Core sound is full, round and warm and has a complex overtone spectrum causing brilliance and clarity and a great power of projection. * Sound can be big and powerful as well as gentle and tender. 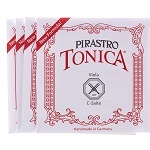 Pirastro's Tonica viola strings are made with the very same kind of technology that the Thomastik Dominants are made. 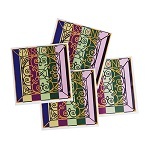 They have a similar synthetic core and also come in 3 gauges. Medium being the predominant gauge ordered. A lot of people that use the Dominants will usually like the Tonicas. Some players say that the Dominants are a tad brighter in tone, with the Tonicas sounding a bit warmer. Of course it depends on other variables, primarily the particular viola and the subjective requirements of the player as well. Tonica also has an additional C string that comes in Tungsten. If you have a slow responding C string on your viola, the Tungsten C might offer more 'zip' to it as it is a brighter and thinner string. 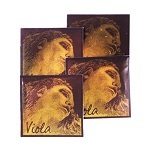 * Evah Pirazzi Gold strings have a core made from a modern synthetic multifilament fibre. 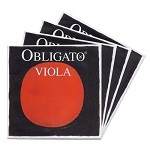 * The great dynamic range allows skilled players to explore confidently both the finest nuances of quiet passages and create powerful sonorities when playing close to the finger-board or using a strong bow arm. * The new Evah Pirazzi Gold steel A-string has been further improved to provide superior responsiveness thanks to our unique construction method. * This new steel A-string has a grand, elegant and smooth tone even while being played in the higher register. * Developed for the player looking for something slightly warmer than the Passione steel A-string. * Great sound depth with no metallic sharpness to the ear. * Enormous capacity and power. 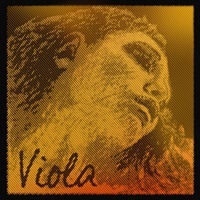 Evah Pirazzi strings emphasize the individual sound picture of each instrument.